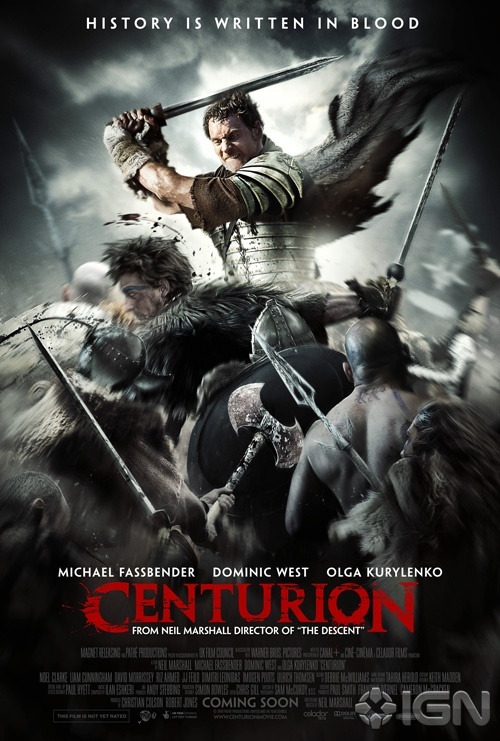 Be it as it may, to compare Centurion (a British movie by the way) to those above mentioned movies is very unfortunate for it because it is not up to the comparison, I’m afraid. Nevertheless it is entertaining. However, compared to the three others, Centurion is super gory. And there are a lot of very combative warrior women in it. By the way, Dominic West, from The Wire, is in this one too but he is not the main character. He stars as General Vilnius. Michael Fassbender has the leading role as the Centurion Quintus Dias. The German actor Fassbender could already be seen in 300, Inglourious Basterds and The Devil’s Whore, to name but a few of his movies. The year is 117 AD. The Roman Empire stretches from Spain to Egypt and as far as the Black Sea in the East. Only Britain is fighting off its invaders. The Empire is stopped by the savagely fierce Picts. Centurion Quintus Dias is the only survivor of a Pictish raid. He joins the legendary Ninth Legion of General Vilnius who is on a mission to erase the Picts and their leader Gorlacon from the face of the earth. When they are ambushed and the general is captured Quintus Dias is left alone with a small platoon far behind enemy lines. They first attempt to free their general and after this the real hunt begins. Led by a female warrior tracker (Olga Kurylenko), surnamed she-wolf, who has been mutilated by Romans in her youth and sworn to destroy each and every one of them, the Picts hunt them relentlessly. Without the help of a Pictish outcast, said to be a witch, they would not stand a chance but even so, they are soon highly decimated and in great trouble. As said before, Centurion is really gory. It reminded me of Gladiator because of the battles in the woods. Of King Arthur because of the way they flee and are hunted, because of the scenerey, mountains and snow and also because of the female warriors. Same for 300. A little group outnumbered by a fierce enemy. The end however is quite different from the other three. As I already said, it is not as good as the other three mentioned movies, since it is not heavy on psychology and the Picts are shown as savages whereas we are led to believe the Romans were faultless, but it is an entertaining watch with loads of battle and fighting scenes. For a change the trailer is quite true to the movie. This entry was posted in History, Movie, Reviews, Roman Empire, Trailer, War Movie, Women in War Movies and tagged Action, Centurion, Dominic West, Drama, Gory movie, History, Michael Fassbender, Movie Trailer, Movies, Olga Kurylenko, Reviews, Roman Empire, War Movies, Women in War Movies. Totally agree with your analysis. Sometimes you have to take a break from more serious fare and watch some entertaining trash. I will review it later, so I cannot comment on its historical accuracy yet. It has a tone similar to the Starz series Spartacus: Blood and Sand. This is a good thing if you like your violence graphic. I love the parts where the blood literally splashes on the camera lens! This is very much a guys movie. The fact there are some female characters is not to attract female viewers, believe me. You have to admire the director’s ability not to be redundant on what parts of the body get hacked off or impaled. They must have had a check list of what mutilations had taken place already. One thing I think needs to be mentioned. The Romans are the “good guys” in the movie, but a case could be made that the Picts had right on their side. They are the ones who are being threatened by Roman expansion. Specifically, the main villainess hade her family killed and herself raped by Romans. Certainly she had just cause for revenge and yet the audience is set up to cheer her death. In this respect the movie joins other war films like Zulu and Breaker Morant. I had a problem with the depiction of the woman and found it was lacking logic. I don’t really see parallels with Zulu or Breaker Morant but admittedly my memory of Zulu is somewhat blurred. When I metioned Zulu and Breaker Morant I was thinking of movies where the Europeans are depicted as the heroes against the savage rebels. Now, granted, the Zulus and the Boers could not be considered as civilized as the British, but who is trying to defend their homes from foreign conquerors? I have also thought of the parallels with many American westerns where the Indians are playing the role of the Picts.